The two had to battle through a huge field of surfers from all over the world to claim the first combined QS6,000 of the season. 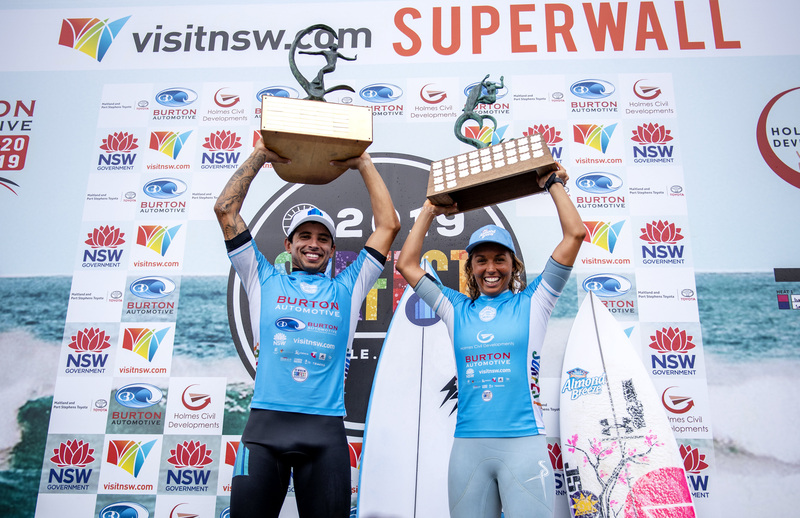 Alex Ribeiro (BRA) and Sally Fitzgibbons (AUS) take out the 34th Annual Newcastle Surfest QS6,000. 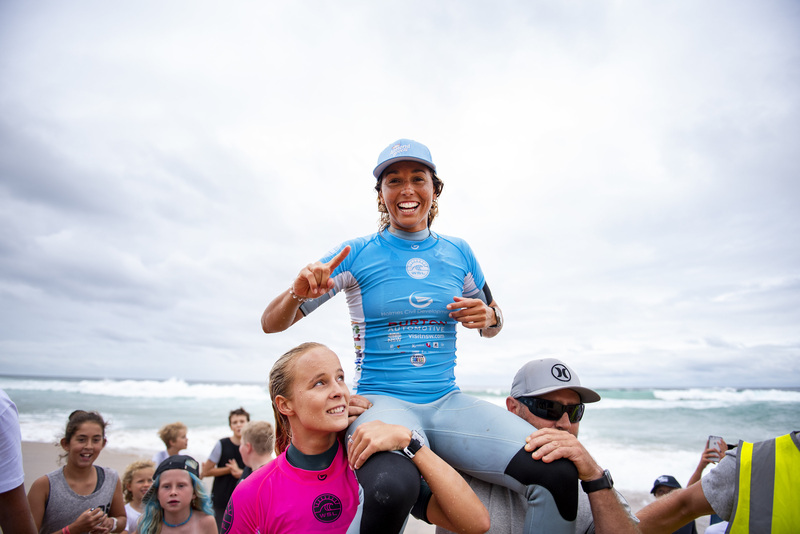 Merewether, NSW / AUS (Sunday, March 17, 2019) – Sally Fitzgibbons (AUS) and Alex Ribiero (BRA) have claimed victory at the 34th annual Newcastle Surfest, World Surf League (WSL) Qualifying Series (QS) 6000 event in excellent waves at Merewether Beach. Pictured: Isabella Nichols (AUS) chairs Finals opponent Sally Fitzgibbons (AUS) to victory at the Holmes Civil Developments Pro at Merewether. Alex Ribeiro (BRA) boosting to victory at the Burton Automotive Pro, Merewether. Pictured: Isabella Nichols posting her best result to date at the Holmes Civil Developments Pro QS6,000. 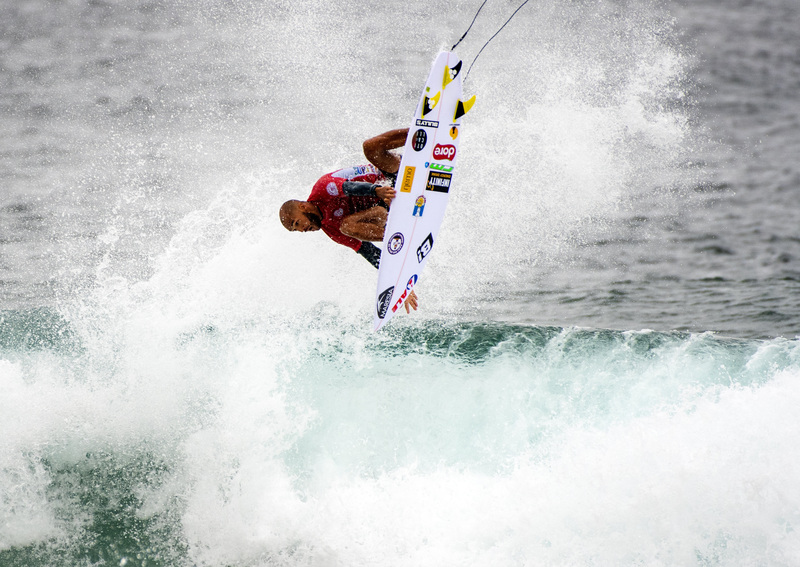 Credit: © WSL / Tom BennettIn the Final, Alex Ribeiro had the tough task of taking on Championship Tour competitor Jadson Andre (BRA) who was fresh off a win at a recent QS6,000 in his home country of Brazil. Jadson was the man to beat, posting excellent scores throughout Finals Day for some huge airs in the peaky Merewether ramps. Andre, who now leads the QS rankings, had a premonition that he would make it to the final and not win the event but finish second. Pictured: Jadson Andre (BRA) finishing runner-up at the Burton Automotive Pro, Merewether. The 2019 Burton Automotive Pro and Holmes Civil Developments Pro QS6,000 events will run from March 11 – 17 and be broadcast live at www.worldsurfleague.com. Head here or to the free WSL App for more information. Surfest Newcastle Australia 2019 will be made possible through the support of Burton Automotive, the NSW Government through Destination NSW, crowdfunding from the Newcastle business community, Orica, The City of Newcastle and Wandiyali. The event will feature international fields of competitive surfers in the Burton Automotive Pro (World Surf League Men’s Qualifying Series 6000 point event), the Holmes Civil Developments Women’s Pro (World Surf League Women’s &ifying Series 6000 point event) and the Lake Mac City Pro Junior (World Surf League Qualifying Series 1000 point event) along with a broad range of complementary surfing events. 2019 will mark the event’s 34th anniversary, attracting over 850 national and international competitors from more than two dozen countries. Surfest Newcastle Australia is the largest festival of surfing in the southern hemisphere. The World Surf League (WSL) is dedicated to celebrating the world’s best surfing on the world’s best waves through a variety of best-in-class audience platforms. The organization, headquartered in Santa Monica, is a global sport with regional offices in Australia, Africa, North America, South America, Hawaii, Japan and Europe.The WSL has been championing the world’s best surfing since 1976, annually running more than 180 global events across the Men’s and Women’s Championship Tours, the Big Wave Tour, Qualifying Series, Junior and Longboard Championships, as well as the WSL Big Wave Awards. The League possesses a deep appreciation for the sport’s rich heritage while promoting progression, innovation and performance at the highest levels, and in doing so crowns the undisputed Men’s and Women’s World Champions across all tours.Showcasing the world’s best surfing on its digital platform at WorldSurfLeague.com, the WSL has a passionate global fan base with millions tuning in to see world-class athletes like Kelly Slater, Stephanie Gilmore, Tyler Wright, John Florence, Lakey Peterson, Paige Alms, Kai Lenny, Steven Sawyer, Soleil Errico, Carissa Moore, Gabriel Medina, Courtney Conlogue and more battle on the most dynamic field of play of any global sport.